Culturally, the United States tends to forget the Great War in favor of its bigger, bolder, historical sequel, World War II. That war began two decades after the War to End All Wars ended with the signing of the Treaty of Versailles in 1919; the two are now inextricably linked in name and historical study. American fascination with the second World War makes sense, as the nation was involved for a longer period of time, sent more soldiers overseas, and came out of the conflict as an undeniable global superpower for the first time. The historical legacy of World War I is less familiar to many of us as the twentieth century recedes into our national rearview. 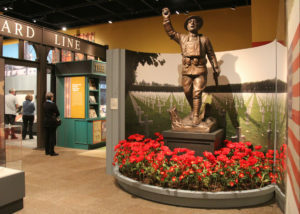 The Virginia Museum of History and Culture’s centennial exhibit, World War I America, seeks to inform the public about the mechanics of the war, the political shifts it inspired, and the cultural, economic, and social developments happening domestically as conflict raged across the globe. Exploring World War I America, the exhibit, feels akin to what it would be like to read a newspaper or magazine from the time period. It has a bit of everything — a section on the specific battles of the war, a theater set-up to watch early films, testimonials from African-Americans describing their experience with the Great Migration — and revels in its many different directions. At its best, the exhibit encourages you to think about multiple cultural events and changes occurring at the same time, conveying the relation of historical events to each other and giving them additional weight that would be unachievable in isolation. Much like today’s political climate, which can often feel like a barrage of news and developments at home and abroad, the first decades of the twentieth century were characterized by a convergence of new voices, ideas, inventions, and conflicts. As the largest traveling exhibition on the Great War, the exhibit provides extensive opportunities to explore the different facets of American life during the war. Artifacts, videos, firsthand accounts, and a few well-selected interactive elements heighten the experience beyond reading the text, which is informative without being overbearing. After leaving the museum, my grandma and I had a discussion in the car about the elements we enjoyed, what we learned, and what we had taken from the exhibit. The conversation made me think about the convergence of two different generations, and using historical study as a way to establish connections between them. In this way, World War I America achieves and exceeds its goal to define the Great War’s importance to contemporary American culture. Recommended for ages 13 and up (lots of reading requires comprehension and patience). 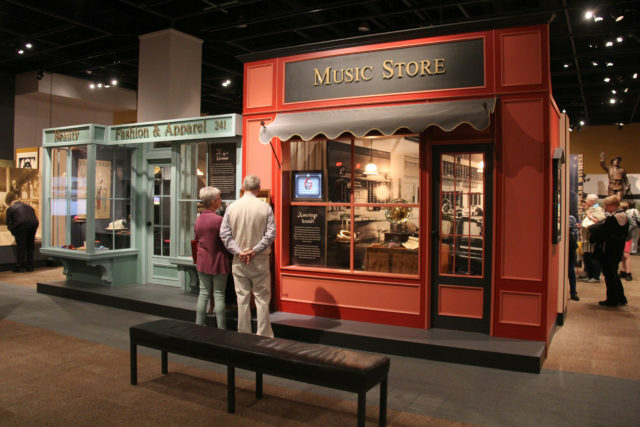 The Virginia Museum of History and Culture (formerly the Virginia Historical Society) admission is free for active duty military and their immediate family and well as military veterans. World War I America through July 29, 2018, so keep it on your list for summer destinations when family and friends come to town. 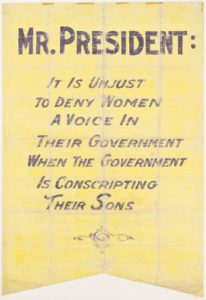 Visit the VMHS at virginiahistory.org for more informatin.